Glister Butterworth and her dad live in the ramshackle, and magical castle known as Chilblain Hall. When the village enters a competition and the Hall is frowned upon, the Hall takes umbrage. So the building pulls up roots, so to speak, and runs away. Glister and her father find a new place to live – a nicer place – but it simply will not due. Draft free and quaint, it is not home. Fortunately for Glister, the ghost writer of the house sends her letters and eventually Glister persuades Chilblain Hall to return, but not before making some concessions. This is a cute story about a girl and her eccentric life. The world around Glister is peculiar to say the least, but she is used to all things strange. It makes no difference to her, although the mail carrier is none too happy about the goings-on. Watson manages to put together a very British comic about a girl, her house, a troll and the world, and somehow it all makes sense and fits together well. GLISTER is amazingly quaint and low-key. There are no battles, no great journeys, no heroic archetypes, just a girl and her quiet life, but I like it that way. Waston’s art is as quaint as his writing and is also representative of his meandering style. Color would have made the comic better. Young kids will struggle with Glister because of the British language, but there is nothing offensive or problematic about Glister that would hinder it being available to children. 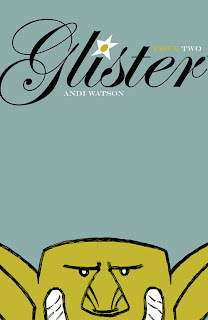 Besides the fact that it will take children some time to get used to the language, GLISTER is a study of a more slow-paced, meandering style of story telling than the traditional super hero comic. For those children who are looking for something a bit different, this may be just the thing. If a teacher were to teach about personification, then GLISTER would be great. Chilblain Hall definitely takes on human characteristics, but it does so without dialogue, which is interesting, but the Hall is still a character. GLISTER Volumes 1 and 3 are also available. GLISTER is different. It is not traditional fantasy. It’s not traditional in many ways, which is why I recommend it for the classroom. GLISTER fills a void that other comics leave wide open.